The Kings Hall, Stoke, was packed on Saturday night! 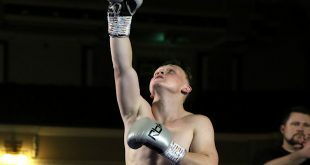 The Carl Greaves Promotion in association with Scott Lawton’s Impact Boxing, featured eight contests headlined by the Vacant BBBofC Midlands area Super-Middleweight Title fight between Jamal Le Doux of Hanley and Corey Jackson of Basford, Nottingham. Both men used a variety of punches throughout with Le Doux seemingly gaining confidence with each round. Jackson was sent to his knees in round six following a number of rights to the head and was only up just in time for the count. Boxing resumed but just seconds (and three shots later) Jackson was on the canvas a second time with Referee Shaun Messer waving the fight off while Jackson was on his knees. 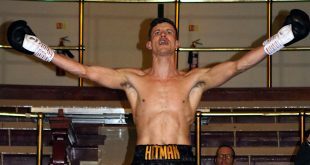 ‘Lethal’ Le Doux wins the vacant Midlands Area Super-Middleweight Title in 1 min 40 seconds of round 6 by TKO and improves to 6 wins with 1 loss. 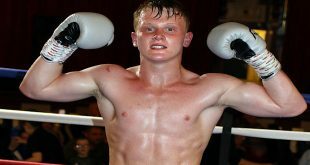 Harry Scarff (Derby) remains undefeated following a 60-55 points win over Alistair ‘Burt’ Warren of Huddersfield. Popular Kaash Buttery of Burslem was quick-footed/handed as per usual and almost immediately was too much for opponent Dylan Draper (Braintree) whose legs were wobbly midway through the opening frame. 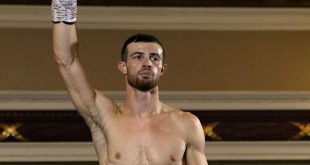 Both boxers were warned for their conduct at the end of round 2 by Referee Kevin Parker. Draper sustained a cut to the mid-forehead in round 5 but Buttery settled for the 60-53 points win.